We’d love your help. 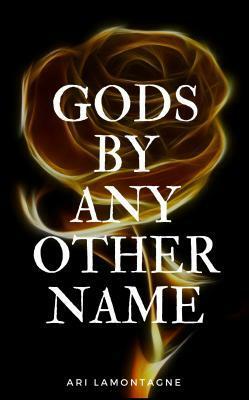 Let us know what’s wrong with this preview of Gods by any Other Name by Ari LaMontagne. Kieran Byrne is a vibrant, party-loving trickster with a penchant for getting into far more trouble than most can tolerate. When his boss, the notoriously ruthless mafia boss Emilio Russo tasks him with capturing the fairy that's been wreaking havoc on their bootlegging operation as punishment for his latest misstep, Kieran assumes it'll be nothing but a tedious little odd Kieran Byrne is a vibrant, party-loving trickster with a penchant for getting into far more trouble than most can tolerate. When his boss, the notoriously ruthless mafia boss Emilio Russo tasks him with capturing the fairy that's been wreaking havoc on their bootlegging operation as punishment for his latest misstep, Kieran assumes it'll be nothing but a tedious little odd job to keep him out of his boss's hair for awhile. Instead, Kieran finds himself embroiled in a power struggle between old gods and new kings, and he must decide which side to take if he hopes to make it home alive. To ask other readers questions about Gods by any Other Name, please sign up. I really loved the protagonist of this book. For someone who has a history of killing people on boss’s orders, Kieran is surprisingly kind and warm-hearted, witty and funny in a way that’s delightfully infuriating to other characters (the mischievous fairy Shoshanna, for example!) I also found him to be wonderfully refreshing in so many ways, not least because he is the son of an interracial couple (Irish fae on his father’s side and Indian shapeshifter on the other) a neat nod, I thought, to America’s immigrant history and rarely seen in this genre of fiction. I also picked up on a few subtle instances of real-world racism being explored through the use of fae as an oppressed group (“Doesn’t it sting, being robbed of your individuality so you’re lumped in with every other creature who ever looked like you? Tell me, do you dislike being looked at as nothing more than a cariacature of your kind?”). A couple of things that detracted from my reading experience: this is an independently published novel and it does occasionally show itself through the odd clunky sentence, extended dialogue exchange, typo or missing word. I also really loved the concept of 1920s American gangsters, but found this side of things to be underdeveloped, as we spend most of our time journeying from the Kentucky distillery to Pittsburgh (journey books again! They are my downfall). The focus instead is on the gods and monsters, which is absolutely fine in and of itself, but I’d have really loved to have seen more of the criminal underworld, particularly within an historical context. This book could have easily been set in the modern day and I don’t think there’d have been much difference. thought it was a super cool concept. loved shoshanna more than any other character. World mythology enthusiast and coffee lover, Ari LaMontagne is an author of fantasy fiction novels inspired by the parallels of mythologies throughout the world. Ari resides in Pittsburgh, Pennsylvania with two rescue cats and far more books than are necessary for one person to own.